I remember the day I decided to become an academic librarian. All of my preparation to work as a YA librarian looked sadly at me in the rearview mirror. Until I started working at a college and realized students WANT many of the programs and accoutrements teens get from their public library. But with a little tweaking. A little more grown-up. (Even if they want to cut out pictures of Selena Gomez and Bieber to make buttons.) I propose next year we do a joint YALSA/ACRL panel discussion of what we can learn from each other. In the meantime, how about doing some book displays in your library? Work with professors in large lecture classes or required courses to highlight items students should read/watch to better understand the course. A great way to connect the collection to their studies. Work with the Career Center to create displays on choosing a major, job-seeking, etc. Staff picks: people love these. I don’t know why. They just do. I do this every year with our graduating student workers. I include a photo and their favorite memories of working at the library. Don’t be afraid to be a little creative. Make decorations or have student workers make them. If they look baby-ish, they are. Google YA librarian blogs or web sites as many of these generous folks have downloads you can use. Include a sign that these items can be checked out. Get a Chase’s Calendar of events. Make a National Pasta Month display, a Wear Pink Day display (in which all books have a pink cover), or whatever crazy holiday catches your eye. Students will appreciate this crazy attention to detail. 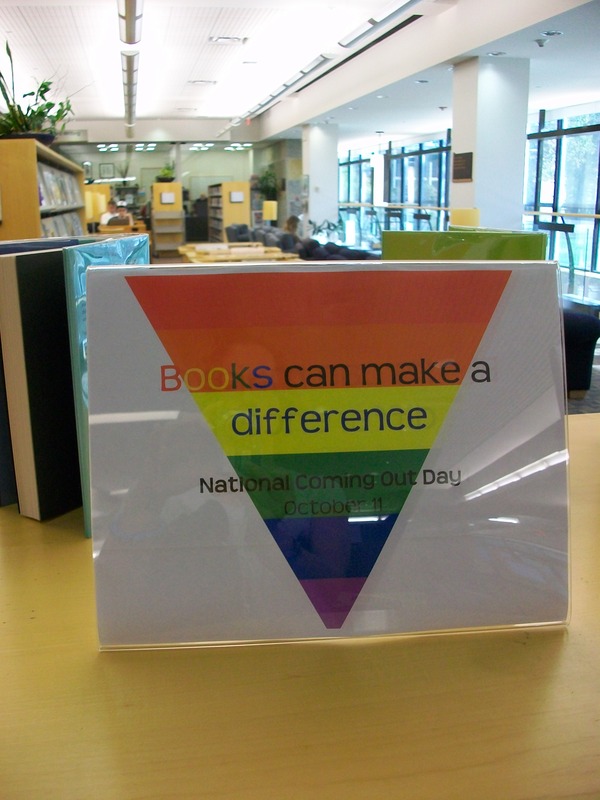 I worked with our Allies club on a Coming Out Day display showcasing LGBT-positive books for young peopleStudents wrote about their favorite books and the impact they had on their coming out.And we promoted a discussion on Coming Out day put on by residence hall directors. ← A few Banned Books Week stuff! And don’t forget to get a library Flickr or Picasa account to share the photos!